However relevant as documents of social history, paintings of psychedelic experience from the 1960s appear today as part of a dated and somewhat quaint genre of pop culture illustration inextricable from drug taking and hippiedom. Yet if we regard these paintings less as capital-A Art (to be assessed alongside fine art icons of the 20th century and contemporary art standards) and more as artistic representations of visionary states, then perhaps their value is in helping us understand how the human brain renders the world, optically, when exposed to hallucinogenic drugs, other mind-enhancing rituals, or simply the liberated imagination. Craig Comstock, who lives with an artist who makes such paintings, offers some of Aldous Huxley's notions of art that induces or depicts visionary experience. Dubiner Shoshanah. 'Lichen Playground' (inset), 2007, 20” x 16”, gouache on watercolor paper. Shoshanah Dubiner is a painter whose work I see every day. It festoons the walls of our home. We change the pieces around frequently, so they do not become invisible by familiarity, for that’s what familiarity with objects primarily breeds. Much of the painting is of microscopic worlds and jungle or underwater settings such as I have never seen. In her work, there are some familiar figures at the human scale, including a wonderful series of dancers, but the pieces that really stand out for me are strange things. We turn to Huxley not as a neurologist, but as a superb guide to what he calls the “antipodies” of the mind . . .
One of my wife’s paintings, 'Endosymbiosis' (below), hangs on permanent exhibit in Amherst, in the science building of the University of Massachusetts. It honors the memory of Professor Lynn Margulis, who discovered evidence for “endosymbiosis”, the process by which one primitive cell engulfed another cell which survived as a resident, to their mutual benefit. At first the idea was thought to be crazy, but evidence piled up, and now her finding is in textbooks. 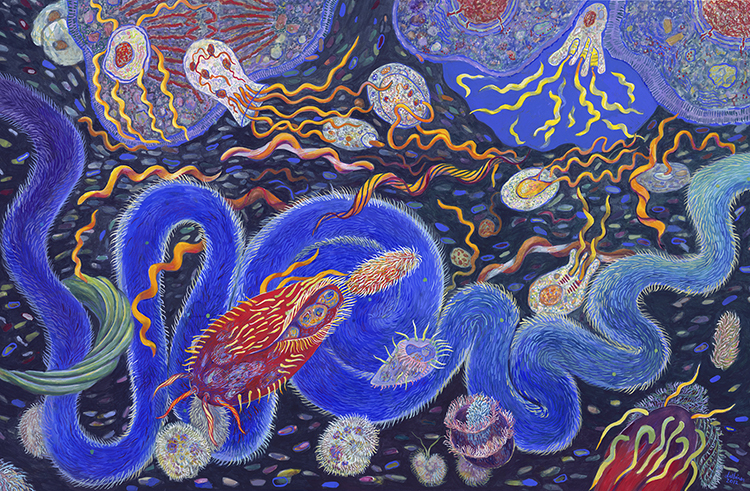 Dubiner, Shoshanah, 'Endosymbiosis,' 2012, 35” x 22.5”, gouache on Rising Stonehenge paper. 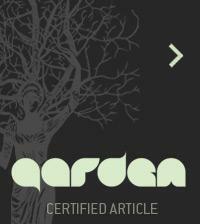 “Endosymbiosis” is not only in the university where Margulis taught, but also in at least five publications. I was reminded of it by reading an old volume by Aldous Huxley. After writing his celebrated account of a mescaline experience (The Doors of Perception, 1954), Huxley produced a less noticed volume mainly on art that induces, or at least depicts, visionary experience (Heaven and Hell, 1956). In seeking vision-inducing art, Huxley focused both on things seen very close-up and on far-away landscapes. 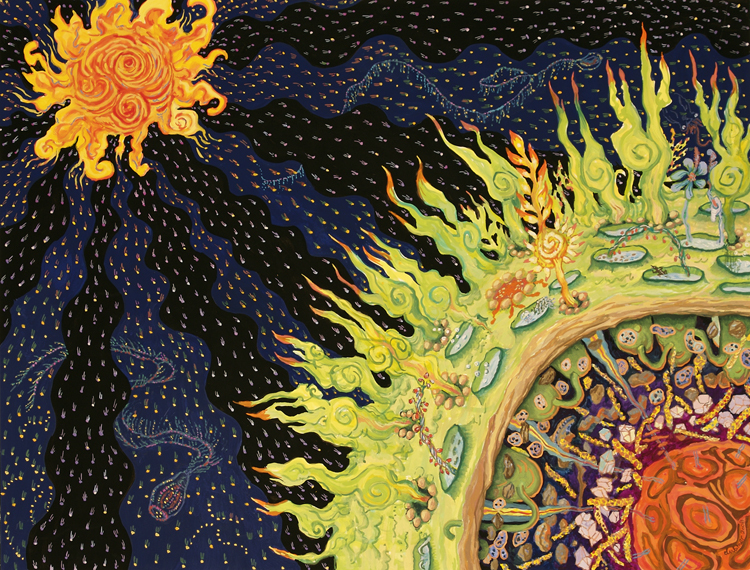 Dubiner, Shoshanah, 'The Deep', 2008, 25” x 19”, gouache on Arches watercolor paper. After taking the mindful molecule mescaline, Huxley searched his capacious memory for “vision-inducing art,” art that had the “gleam” of psychedelic or mystic experience. Even when depicting familiar things at the human scale, Dubiner’s art can suggest an intensity that is unusual. But most of her painting turns to objects seldom seen, whether the extremely tiny world, jungles unfamiliar to inhabitants of temperate zones, or undersea life. Above all, her art shows life as if humans could go where they are in fact never found, such as gremlins glowering in the foliage (below). 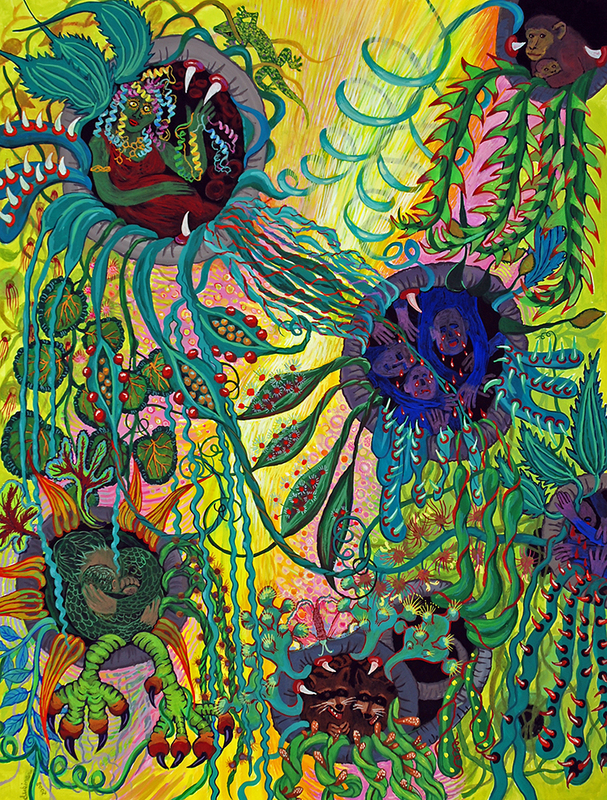 Dubiner, Shoshanah, 'Mother of Molecules', 2008, 22.5” x 30”, gouache on Arches watercolor paper. What is the value of an art of mixed scales, or of other strangeness? According to Huxley’s interpretation of his day on mescaline, our brain is a “reducing valve,” which restricts our consciousness to what helps with survival. He doesn’t say how the brain accomplishes this amazing feat, except for a vague and ridiculous theory about psychedelics reducing the “efficiency” of the brain by depriving it of adequate sugar. Rather we turn to Huxley not as a neurologist, but as a superb guide to at least part of what he calls the “antipodies” of the mind, the place where we find the opposite of ordinary consciousness. It is difficult to bring anything back from the visionary world where shimmering soap bubbles play in the air, only to be reduced, when most of us try to capture them, to a pathetic spatter of liquid. As an artist, Dubiner can import the shimmer. Exquisite borderlining on the ineffable, not only the description but the work, too. I thoroughly enjoyed Comstock's provocative writing about altered states while gazing into the vibrant world of Shoshanah Dubiner's art. This served as a luxuriant mind enhancer, this dance of word and image. Quite exquisite! Thank You.